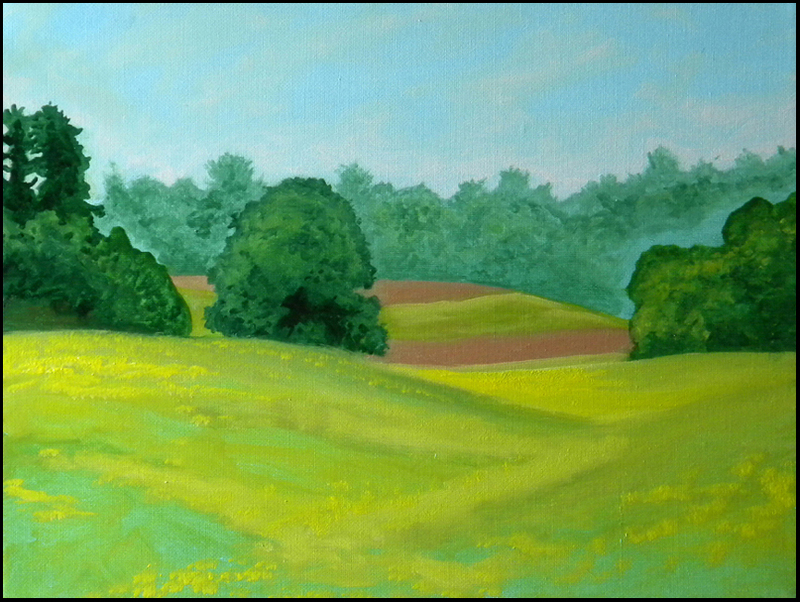 Buttercup Time aka Down the Intervale #5 • oil on linen 11″ x 14″ • $154 • Painted in May 2010 while I was house-sitting the family farm in Dayton, Maine where I had grown up, for two weeks while my brother Clark and his wife were in California visiting their daughter. Great Bay of the Piscataqua as seen from Moody Point, Newmarket, NH • oil on wood panel (repurposed drawer front) 7″ x 16″ • $112. • Painted on site while visiting old friends Heinz & Diane Sauk-Schubert who were living at the time on this impressively large body of tidal water which divides southern coastal Maine from New Hampshire. 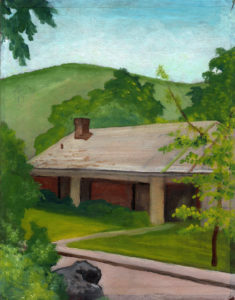 Vermont Hillside aka My Own Private Mont Sainte-Victoire #2 • oil on cardboard backing from an old picture frame, 10″ x 8″ • $40 • This was one of a series of small paintings devoted to the magnificent hillside that loomed across the valley from where I stayed on Pleasant Street while visiting Springfield, Vermont. The series was named as an homage to French impressionist Paul Cezanne (1839–1906) and his obsession with Mont Sainte-Victoire in Southern France that he immortalized repeatedly. 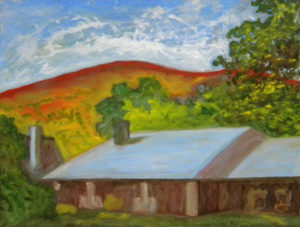 Vermont Hillside aka My Own Private Mont Sainte-Victoire #4 • oil on masonite panel 10″ x 13″ • #130. Same hillside as the above paintings, from the fall of 2010, a companion piece to a smaller painting of the same scene included among sold pieces of art featured in a posting prior to this one. Attic View #1 aka My Own Private Mont Sainte-Victoire #5 • oil on plywood panel 24″ x 18″ • $432. 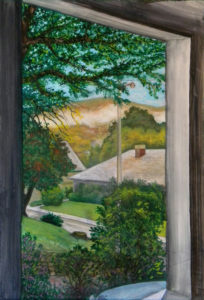 • Seen through the green lace of leaves just outside the window opening, the same Vermont hillside featured in the three works above informs yet another painting. 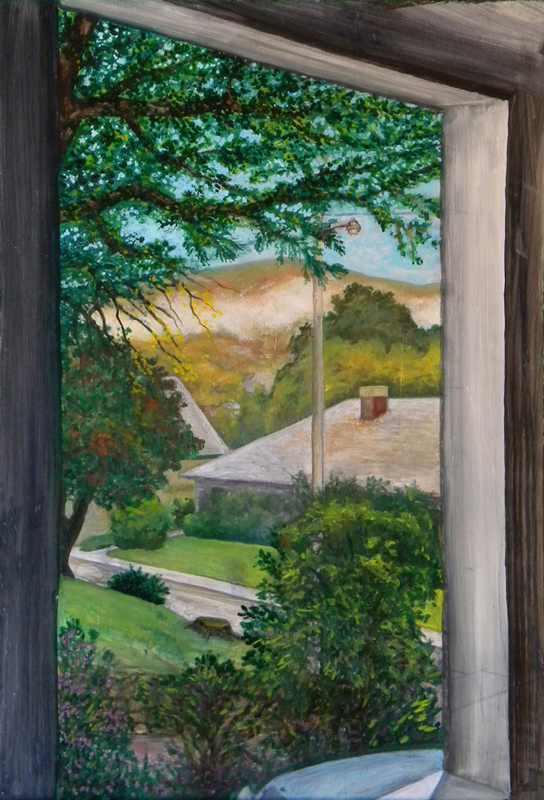 One of many pieces that fit into the category, Inside, Looking Out, which figures prominently in my work. There’s something psychologically transformative about a viewpoint expressed from within a contained area looking outward to the suggestion of a larger world that beckons.. Missing Persons #1 aka The Tree & I • oil on pine board 38″ x 14″ • 532 square inches • $266 • The house on Pleasant Street in Springfield, Vermont where I stayed on occasion in the early 2000s was nestled into the side of a steep hill. Downtown Springfield, a small New England factory town, was built on the sides of hills that drop precipitously down to the rapids of the Black River which descends through town via a series of falls, eventually joining the Connecticut River a few miles east dividing Vermont from New Hampshire. Made famous in the early 20th century as a producer of high-quality precision measuring instruments, the town was built on water power, which gives off a constant sound in that part of town, a result of the various dams created by factories claiming their share of energy from the ever-flowing source. The back of the house looks out into a small lawn and garden area that had been cut into the hill, over which presides one of the larger trees – an imposing oak – I’ve ever lived under the shadow of. The title Missing Persons refers to the emptiness of the lawn chairs whose function is to hold people able to sit and relax. Instead I was busy painting – a comment on activity versus inactivity. I enjoyed the thought of two surreal alternative scenarios: possibly the individuals sitting in those chairs had been abducted by aliens, either the terrestrial or extra-terrestrial variety, just before the painting was finished. Or possibly they were ‘raptured’ into outer space, from where they are watching it all happen down here below on earth. Center City Philadelphia #2 • oil on plywood panel framed in vintage window sash (from the house in which I grew up) 24″ x 24″• 576 square inches • $288. 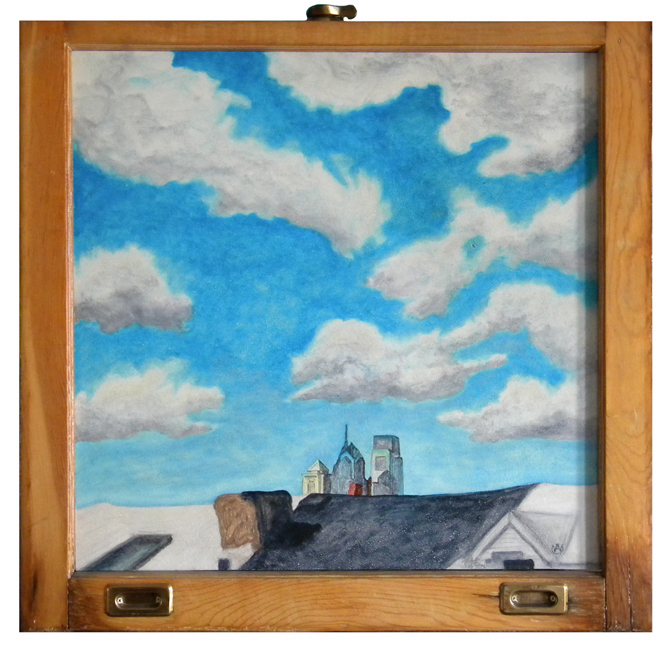 In the fall of 2010 I painted my first views of Center City Philadelphia from my 3rd floor painting studio. From there, I look out over a roof-line of other three-story houses, to the cluster of skyscrapers about a mile and a half away that showcase Philadelphia’s amazing growth over the thirty-two years I’ve been living here. Much more whimsical is the painting below, than this straight-forward account that is primarily a sky painting. Center City Philadelphia #1 • oil on found-and-repurposed bread board 20″ x 9″ • 180 square inches • $90. 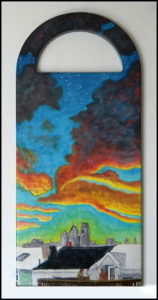 This was my first attempt at a painted city-scape, imaginatively trying to show the transition from day to night using brilliant colors that did not try to imitate reality.